SKILLET granola. For those times when your yogurt cup is a little lonely and you don’t have 45 minutes to bake a tray of granola. If I didn’t just use the term life-changing to describe my gluten-free, flour-free, vegan chocolate chip cookies, I probably would have used it here. But, I won’t. Flair for the dramatic is one of my strong suits but even I can’t call two things life-changing in the same week. What’s right under life-changing? That’s this granola. I’ve always been a homemade granola fan. Always have, always will. 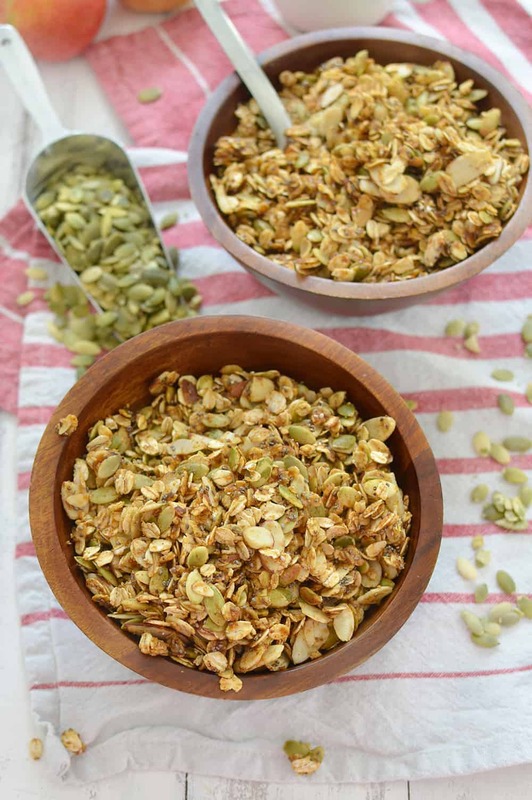 It was one of the first recipes that I ever perfected as a home cook and something that I find myself baking almost every time I find a half-empty oat carton in the pantry. It’s fairly simple to make and 1/16th of the price that you’d find in a grocery store; imperative musts for DIYing this at home. 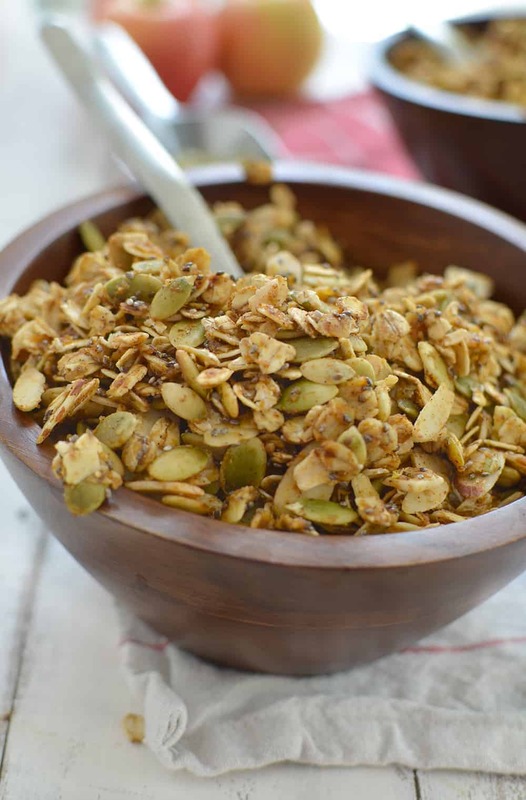 If you’ve been intimidated by making granola in the past- or seek immediate gratification- this granola is for you. Ready in just 10 minutes from start to finish, this is the granola your autumn morning has been waiting for. I didn’t even know skillet granola was a thing until I tasted the Almond Board of California’s version at the Almond Orchard tour in August and then again at Blog Brulee earlier this month. Their Gluten Free Skillet Granola was one of those things that you know you need the recipe for after the first bite. Studded with candied ginger, toasted almonds, and orange zest, it was warm, comforting and flavorful. Now that we are thisclose to the start of October, I’m pulling off the we-can’t-have-pumpkin-yet gloves and diving in head first. I need to feel ready for any season change, especially since I know I will be missing summer in a major way this year- if the impending winter storm doom warnings are anything to be trusted. After scoring the Almond Board’s granola recipe, I decided to create a pumpkin version. Just like the original, this comes together in just 10 minutes and is the perfect thing to sprinkle on freshly baked apples, fruit salad, yogurt bowls, or eat by the fistfuls. I actually prefer to eat this like a cereal, covered with ice-cold almond milk. However you decide to make it, just promise me you will. 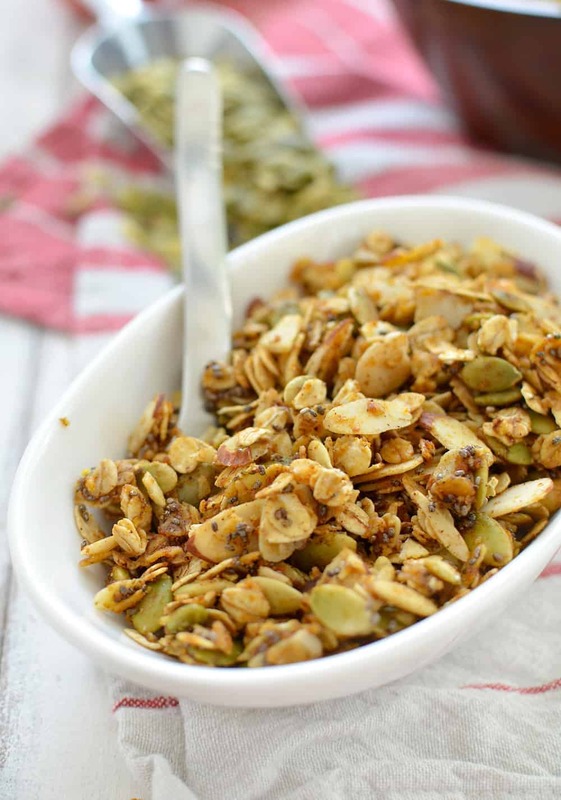 It will completely change the way you think about granola. It’s easy to make, pumpkin-inspired, warm, toasty, and ready in a flash. 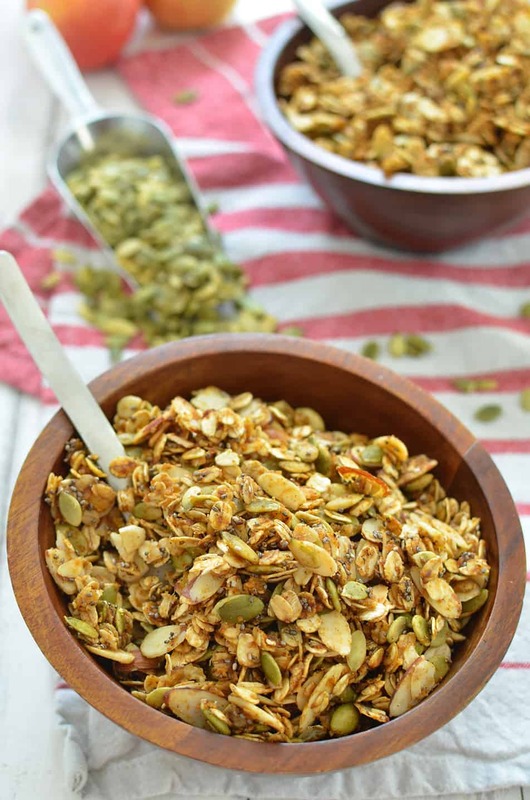 Granola made simple- and healthy! 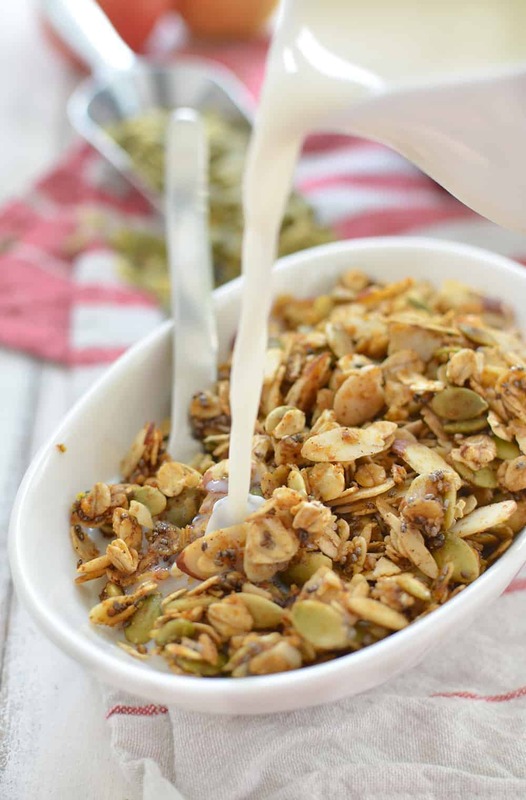 Skillet Pumpkin Granola- ready in just 10 minutes! Cook everything on the stove and enjoy. Vegan and Glutenfree. Heat a large nonstick skillet over medium heat. 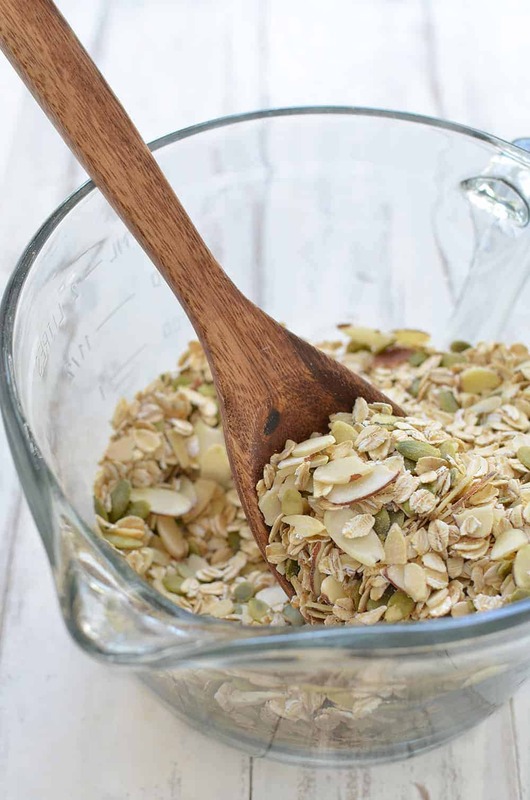 Add the oats, almonds and pumpkin seeds and cook for 6-8 minutes or until beginning to lightly brown, stirring frequently with a spatula or wooden spoon. Add in the chia seeds, salt and pumpkin pie spice and quickly mix together. In a separate container, whisk together the pumpkin puree, oil, and maple syrup together. Drizzle in the pumpkin-maple mixture oil and crumble sugar over all; cook 2 minutes, stirring constantly until all granola is covered in the wet mixture and begins to clump and toast together. Remove from heat and stir in the orange or lemon zest. Serve warm or room temperature. Store in an airtight container at room temperature for up to two weeks. That Almond Board granola was the first thing I cooked when I got home. So fast! Looking forward to trying your spin on it. Thanks Katie! Obviously mine too. Can’t believe how simple it was! 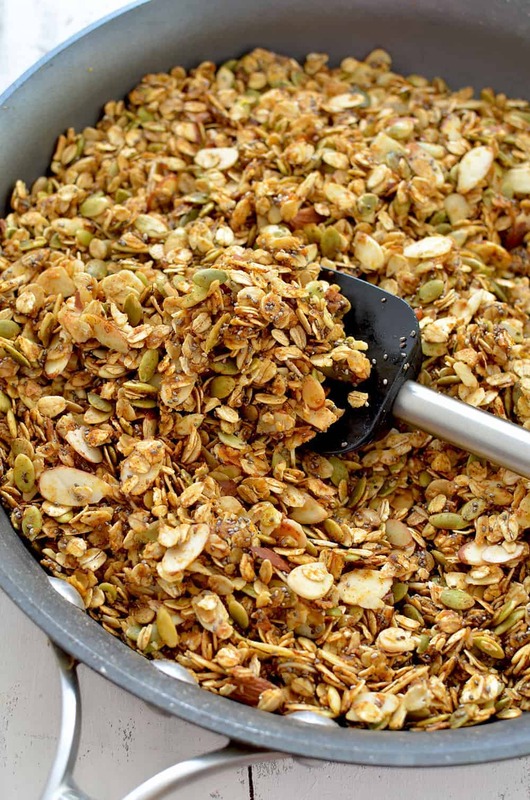 One of my former professors asked me to develop an easy peasy granola recipe, and I think a skillet granola is something I should try! And yay to all the pumpkin things! So easy! 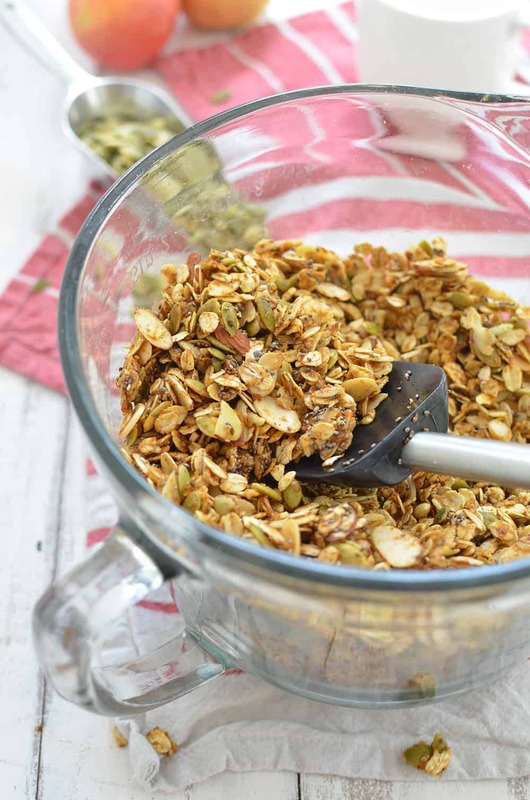 I seriously may never make regular granola again, I just love how easy this is! I just tried it last month and I LOVE how easy it is! You’ve gotta try it! Whoops! Total brain-fart moment. Nothing, I accidently wrote step 5 twice. I really need to stop writing recipes past my bedtime 🙂 Did you make it? Let me know how you liked it! It is tasty! I’m going to enjoy eating this. I’ve already shared the recipe with a friend. Thanks!